"'A nice pickle we have landed ourselves in, Mr. Frodo!' he said, shaking his head." For centuries before anyone discovered that Portland Cement made an extremely hard, quick-setting material for sticking bricks together (and later discovered the concept of The Concrete Jungle), lime ruled supreme. Stone and brick were joined with lime mortar, lime plaster lined the inner walls, lime distemper in a range of pretty natural colours decorated walls and ceilings, lime render covered wattle and daub infill on wooden framed houses, you name it. For a long time cement almost completely took over in mortar, and gypsum plasters and synthetic paints pushed lime products into the shadows of historical practices. However, in recent years the excellent properties of lime-based building and decorating products have been rediscovered and I want to tell you more. One thing we can be sure of is that the great towers of Minas Tirith and the little hobbit holes of Hobbiton alike would have used lime in their construction. Portland cement is a 19th century invention and lime had been around for a very, very long time beforehand. The Romans used lime mortar in their magnificent buildings including their fantastic mosaics, and medieval Europe rediscovered the art, producing wonderful constructions such as Warwick Castle, Rouen Cathedral, the Tower of London and many more. On a more domestic scale, lime was relatively cheap and easy to produce, and could be recycled along with the local building materials it was worked with. So what is “Lime” and how do you make it? Well you start with limestone (ever wonder where that name came from?) which you heat up to hundreds of degrees in a lime kiln. These still dot the English landscape in some rural areas where limestone is the natural bedrock, often quite simply built. The heat has the effect of driving off water and carbon dioxide leaving behind the rather lively material known as “Quicklime”. This is nasty stuff. It is eager to regain its lost water, and will take it out of anything it comes into contact with, including careless humans. Water take up is so vigorous that a lot of heat is given off, so it is vital to add lime to water and NOT the other way round to avoid an explosive reaction. Imagine – that first drop of water to make contact goes “boom” and you have a lot of corrosive quicklime thrown up into the air. Not good. Happily for today’s Homely House builder, it is possible to buy something called “hydrated lime” from builders’ merchants. This is quicklime which has had the water put back (in a big factory with lots of automation and Health and Safety regulations!) but is still lacking its carbon dioxide. Although it is a bit alkaline it is safe to handle if a few basic precautions are taken – wear gloves and safety glasses, a dust-mask if you have to handle the powder on a windy day, and you should be fine. Now you’ve got some non-aggressive lime what can you do with it? The powder won’t stick to anything without help will it? Nope, now you need to mix it with water to produce “Lime Putty”. For one bag of hydrated lime, it is probably most convenient to find a lidded container such as a clean plastic rubbish bin/trash can. Half-fill it with cold water, carefully tip in the hydrated lime, and give it a good stir. The sophisticates amongst you can use a power drill with a mixing attachment, but I found that a broom handle worked pretty well although harder work. Lime putty is not made in a day – this is one of those recipes you need to plan in advance. Because of the fine particle size, it takes several days for all of the surfaces to come in contact with the water. You really need to store it for at least a week, and it will happily keep for much, much longer, improving with age. Stir it daily for the first week and every few days after that, checking that a layer of water sits above the putty. The putty will take on a buttery texture, quite smooth and rather soothing to work with. This is now your basic raw material for a host of applications. Lime mortar is the essential material for building or restoring houses which have been made with stone or with old bricks (which were usually fired at a relatively low temperature and are not as hard as modern, factory-made bricks). Old houses which have been repaired with cement mortar often suffer from spalled (cracked) bricks because the impervious cement has held moisture in the bricks, which then fracture when the water freezes. Stone can suffer in the same way. Lime mortar is a semi-permeable material – it will allow water through but also back out again, setting up a dynamic equilibrium which prevents an old house from suffering the damp problems often resulting from unsympathetic restoration with cement. 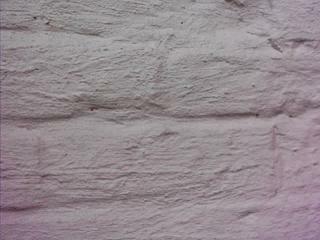 Lime mortar is also good for using in timber-framed houses which need to flex slightly as the timbers move. It is more flexible than cement and will allow the necessary “give”. To make lime mortar, take builders’ sand and lime putty in approximately 3 to 1 proportions. To help it set if you are building or need to do deep pointing between bricks, you should add a pozzolanic material. This can be either stove ash or finely crushed old brick/clay tiles. If you’re dealing with small quantities then crushed terracotta flower-pots would do. In your 3-1 mix you need approx 0.5 parts of pozzolan. Mix very well together, adding water if necessary to get a firm but workable mix. Pure lime putty is very white, and to match existing mortar on your building you can play around with different colours of builders’ sand. Red sand gives an attractive pinkish shade which goes well with old brick. If you live in an area with either clay or sandy soil – not too much organic matter – you can mix a little in to help colour matching. Lime mortar has a clear advantage over cement in use, especially by the non-professional. It sets through take-up of carbon dioxide in the air, so it will take quite a while to dry off. This gives you lots of time to scrape off the sloppy bits, prod extra scoops into accidental holes, and generally mould it into the desired shape. If pointing, you can also leave it to semi-harden before using a finishing tool (soldier) to get the desired profile. In case you didn’t know, pointing is filling in the gaps between brick/stones on the wall face. 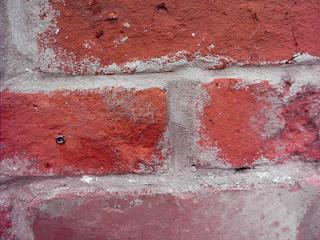 To get lime render, make as for lime mortar but use about half and half and lots more water. If you make it fairly dilute you can brush it on – a bit like a thick paint. Several thin layers are more reliable than one thick one. If covering a large surface, think about colour matching and make sure you have the right colour sand to do the whole wall. Guess how I know this could be a problem? Basically these are made by using lime putty with lots of water, colouring materials, and something to hold it together. Traditional materials included milk solids and rabbit glue. Since I have no personal experience of these (yet) I shall leave you to find out more for yourselves unless I beat you to it, in which case I will write a part II. I have seen some lovely examples of use of lime plasters and distemper. Distemper gives a very attractive matt finish and can be used with special earth pigments to give a range of colours including a fantastic heavenly blue and strawberry pink. Please read all safety instructions on anything you use!